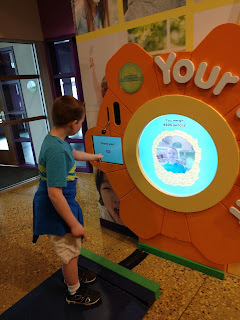 I received free admission to LaunchPad Children's Museum so I could write about it here on my blog. 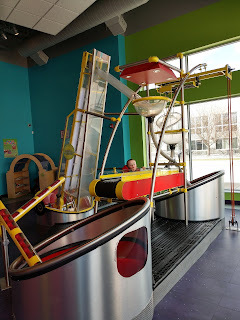 Visiting LaunchPad Children's Museum is one of the most fun things to do in Sioux City with kids! Wondering what it's all about? 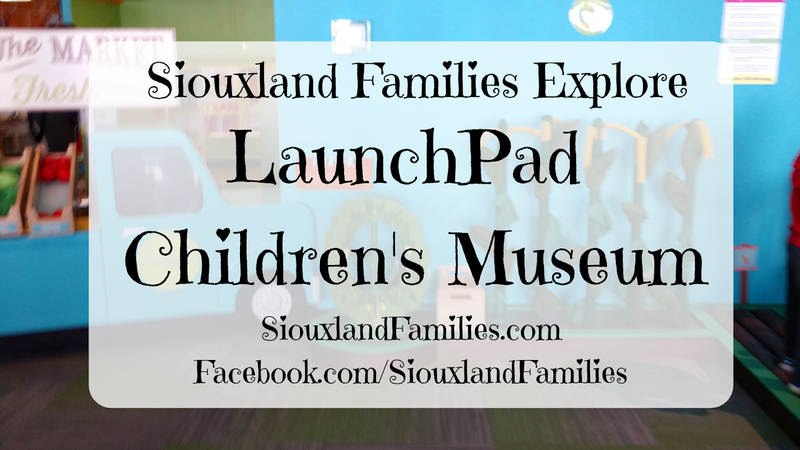 Here's a 60 second look at LaunchPad from the brand new Siouxland Families YouTube Channel! Where is LaunchPad Children's Museum? 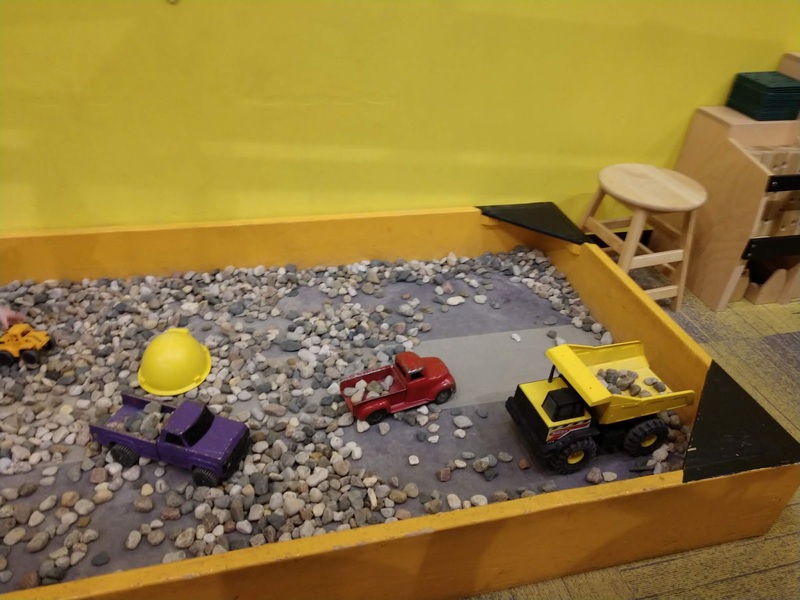 LaunchPad Children's Museum is located in downtown Sioux City, Iowa at 623 Pearl Street and is open from 10am-4:30pm on Tuesday through Sundays except Thursdays, when LaunchPad is open until 7pm. LaunchPad Children's Museum also opens one hour early each day for members-only hour! LaunchPad Sioux City is closed on Mondays. There is metered parking in front of LaunchPad on Pearl Street, and a free parking lot for LaunchPad Children's Museum visitors behind LaunchPad, accessible from Water Street. You can find out more about LaunchPad on the LaunchPad Children's Museum website, and connect with LaunchPad on their Facebook page, Twitter feed, and Instagram feed. How much does it cost to go to LaunchPad Children's Museum? Admission to LaunchPad Children's Museum in Sioux City is free for babies (under 12 months old) and teachers, $8 for kids and adults, and $6 for senior citizens and military. Family membership to LaunchPad Sioux City starts at $99 and includes unlimited visits to LaunchPad for the year and most of their regular programming (some special events, programs, and classes are not included in memberships). What is there to do at LaunchPad Children's Museum? 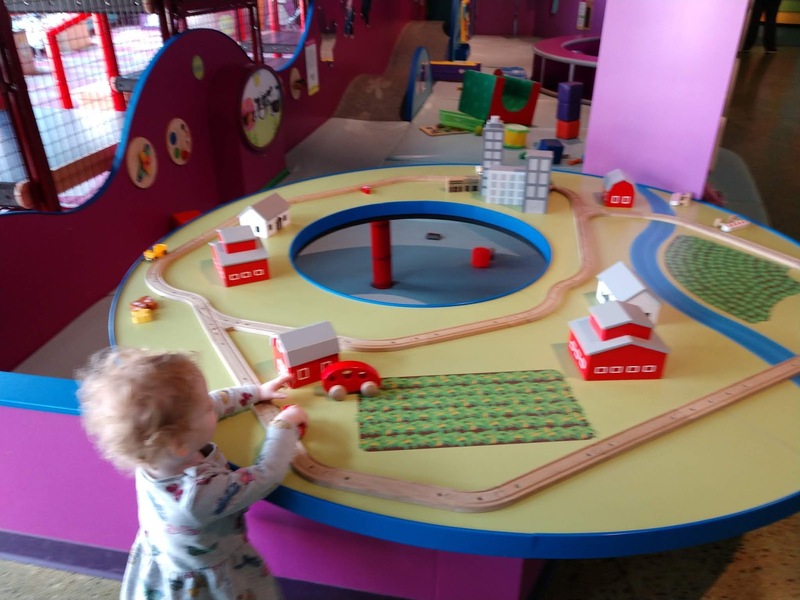 There is tons to do at LaunchPad Children's Museum--too much to put in one section really, so I'm breaking it down for you! These exhibits are at LaunchPad Children's Museum all the time and are great fun all the time! Me & You: Kids can find out fun information like how many pencils would weigh the same as them and how many baseballs tall they are! Block Wall & Build Zone: This is the place for little builders! There's a rock pit full of construction vehicles, a sand table with dinos, plenty of Legos, and lots of wood kids can build whatever they can imagine! Flight Zone: The 3-level rocket ship definitely seems ready to launch! Inside, there are astronaut costumes, a ladder for the crew, lots of cool buttons to push, and a slide to disembark! My 9 year old loved this the most of everything at LaunchPad. Water Table: This is the longest water table I have ever seen, and it's so fun! There was magnetic fishing, tons of toy animals, and as a mom I love that LaunchPad has water smocks hanging on the wall to protect little ones from getting completely soaked when they enjoy the water table. Market & Café: These were the favorite sections for my two youngest kids. The market is an adorable miniature grocery store complete with carts, baskets, scales, a checkout with a conveyor belt that beeps and a cash register, plus tons of play food. Then, there's a soda fountain, and then a tiny café complete with pizza oven. A fun touch was a window between the market and café--just in case a chef needs some fresh produce to whip up the day's special! Kid sized diner booths finished the space to adorable perfection. 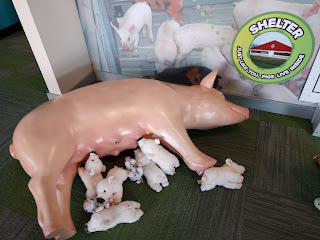 Farm Zone: A big red barn, cow, pigs, chicken coop, and mini farm add awesome Iowa flavor to LaunchPad Children's Museum and were a big hit with all my kids. The barn connects to a big climbing elevated climbing area, and the farm was near the market, which I can see leading to some really cool conversations with kids about how food goes from farm to market to table! Grain elevator in the Farm Zone teaches kids about teamwork and simple machines! Infant & Toddler Area: Near the climbing area and flight zone, there's a little enclosed toddler area, which looked like a great safe place to watch babies and toddlers while older siblings are off climbing and sliding, and had lots of cute age appropriate toys inside. LaunchPad Children's Museum also hosts travelling exhibits. Right now visitors can check out the awesome Nano exhibit highlighting tiny tech, and bringing it to life with huge buildable versions of nano particles! When we went, this was one of my 9 year old's favorite parts. They also have limited time classes and camps, mostly during summer break but also throughout the year. These classes are usually not included with admission or membership, but are reasonably priced, educational, and fun! And one of my favorite events LaunchPad Children's Museum offers is Special Needs Night. A few times a year, LaunchPad hosts kids with special needs and their families at the museum at no cost to the families. As a parent of a kid with special needs, it means a lot to know they care! LaunchPad Children's Museum hosts a few special events throughout the year, including holiday themed events, an art event each summer, and an epic Pirates and Princesses Party in the spring (This year's Pirates and Princesses Party will be on Saturday, April 27th and I'll have a post with full details coming soon!) LaunchPad also hosts private parties, and has more information on their website on how to book with them. Overall, my kids absolutely loved LaunchPad and were really sad to have to leave when it closed for the day. I definitely recommend it to Siouxland families and to visitors to our area! Thanks for the great experience LaunchPad!